I just love the art of Pat Herkal. Besides being an amazing woman her art is full of life and color. 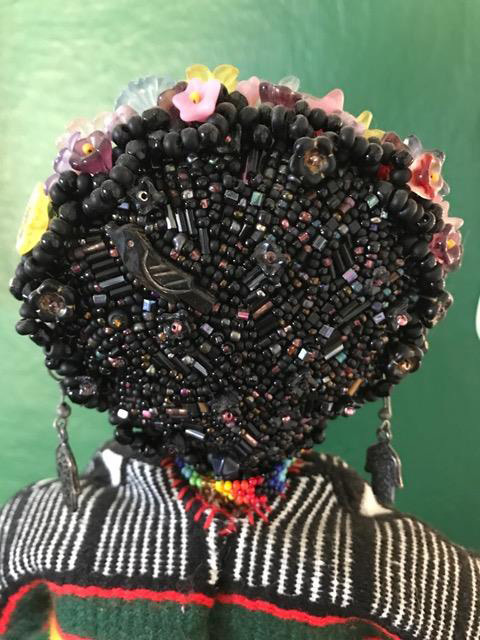 Beads, thread and fabric occupy my head and hands every day. 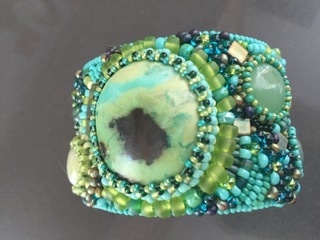 Whimsy, color and the natural world inspire my work. I was raised in a military family. We moved frequently on the east coast and to France. I am a retired nurse. My passion has been fiber ever since my grandmother taught me to embroider and to crochet rag rugs when I was five. My husband and I raised our two daughters in Riverton, Wyoming on the Wind River Reservation. I was active in the art and fiber community, volunteering and participating in craft fairs around the Rockies. My main focus was weaving and quilting. Port Townsend, Washington has been our forever home since 2004. I discovered beads and bead embroidery here and they have taken over my life! 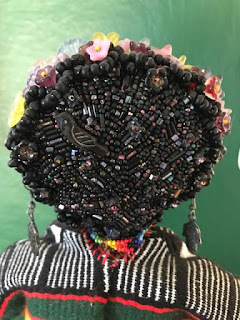 Mixing beads, shells, stones, and found objects - man made and natural - I make jewelry, beaded sculptures and dolls. All are hand sewn one bead at a time. I use ultra suede applied with a beaded edge to finish the back of pieces when required. The smaller the bead the better. I have fun creating, so when people see my work, I hope it makes them smile. I spend my time creating, traveling, gardening and living an artful life. I recently returned to my first art form, embroidery, learned when my mother, brother and I moved in with my grandmother while my father served in the military in Korea. I was five. 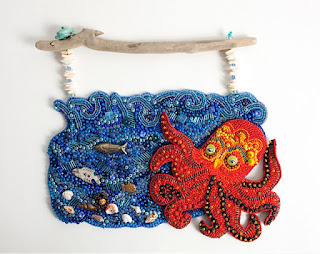 I embellish my vessels and whimsical animals with embroidery then add beads. Frida’s face, legs and arms are beaded on Nicole’s bead backing. I volunteer at Northwind Art Center as a docent and am on the Installation Committee. My beaded pieces were juried into the NAC Artist Showcase for 2016. Other pieces have been juried into numerous shows at NAC over the years. Some have received Merit and People’s Choice awards. I have been juried into two shows at Confluence Gallery in Twisp, Washington. I am an active member of the Surface Design Association and have shown in SDA shows around the Olympic Peninsula. 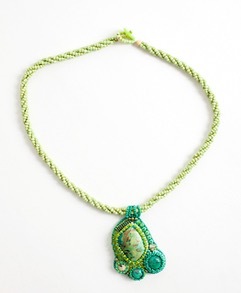 A dear beading friend and mentor encouraged me to start using Nicole’s bead backing a few years ago. Up to that time, I tried different options - they did the deed but were not satisfactory. I tried commercial felt with tracing paper stitched onto the back to give it a firmer hand before beading - ok but not the best solution. Then I purchased a stiff bead backing that only came in white. I water colored it which took away the spontaneous moment of wanting to dive in and BEAD because it had to dry. I also colored it with various markers - all came off on my hands. I have all of Nicole’s bead backing colors and match them to the project at hand. They are the perfect firmness to hold shape but also allow me to flex and bend them as desired. 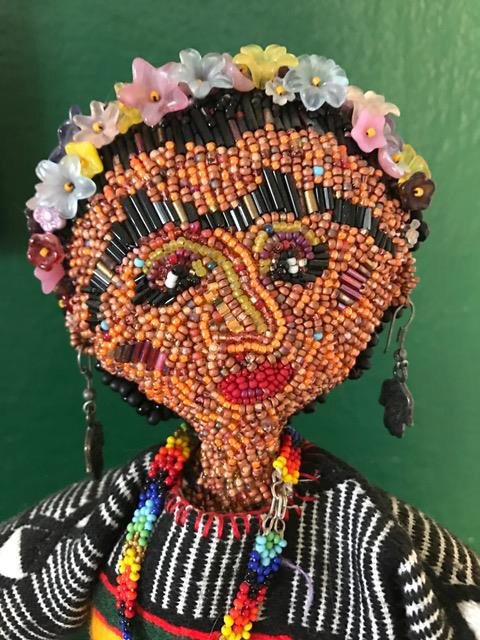 I was inspired to make Frida after reading Barbara Kingsolver’s novel the Lacuna. The folk art of San Miguel de Allende inspire me to produce freely and colorfully. Dropped by for PPF. Thank you for sharing Pat Herkal's art. The pieces are so pretty.I admire the patience and labour going into each one. Oh what charming artworks! I love the octopus one especially. Thank you for sharing Pat Herkal's marvelous art. I loved learning about the inspirations for her work. Thank you for featuring Pat Herkal's marvelous art. Each piece is unique. I love learning about the inspiration for her work. I am so impressed by the beauty and unique qualities of Pat's art. Bravo! I am proud to say that Pat is my friend. Beading was the link that brought us together. 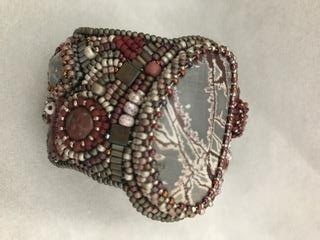 This is a wonderful sampling of her beadwork - it shows her character and part of the wide scope of her art! I love it! Wow!! What amazing creations!! Thank you for introducing to Pat! Big Hugs!